Well, if you want to be king then you’re going to need a respectable hairdo as well as the perfect amount of facial hair on your royal face. If you have too much then people start to mistake you for a homeless peasant but without enough, the kings of distant lands will consider you nothing more than a mere child. So instead of wasting your precious time worrying about the right hairstyle or amount of facial hair to have, we believe we have the perfect solution for you. 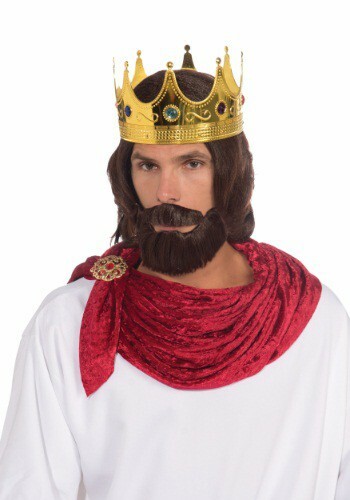 Check out this amazing Adult Royal King Wig and Beard Set! Once you add this wig and beard set to your kingly attire, you’ll not only be the king your royal subjects want to see but the one they want to be as well! Be sure to take a look at the rest of the royal accessories we have available and you will be sure to expand your rule this Halloween!